The saga continues. It is mainly because the Osprey NewVanguard225 has been screaming from my bookshelf for a year or so. It seems to take up more space than an encyclopedia. Partly becaue when I first saw the book I was simply glad the subject had been addressed. This I somewhat regret. 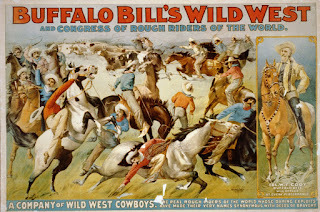 I hope to lay the ghost by writing these blogposts. Last time plate D got it. 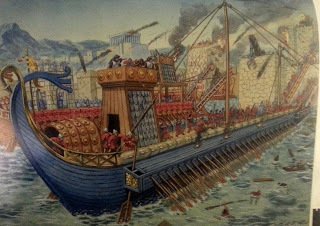 The Quinquereme also illustrated in plate D is not error-free but for now I will jump to plate E- 'The Siege of Syracuse 212B.C.'. 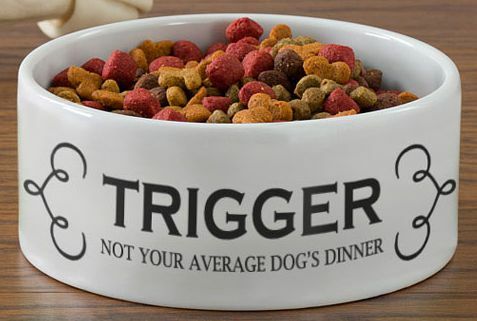 What a dog's dinner. 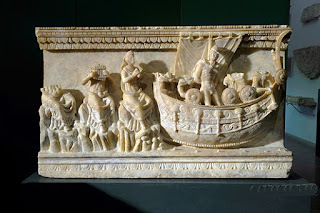 Apart from the dress of the sailors at the stern (see previous blogpost). 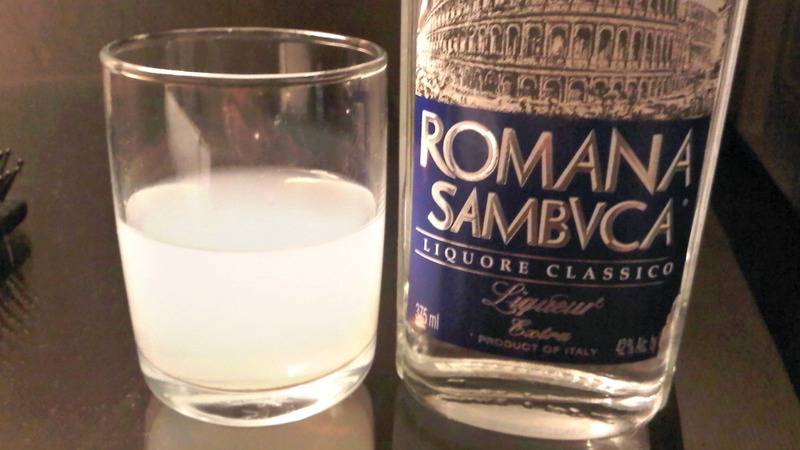 The most salient problem is the theme of the picture, which is the deployment of a sambuca against the walls of Syracuse. 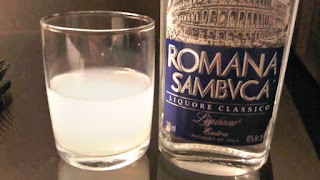 If you are in doubt as to what a sambuca is look here. 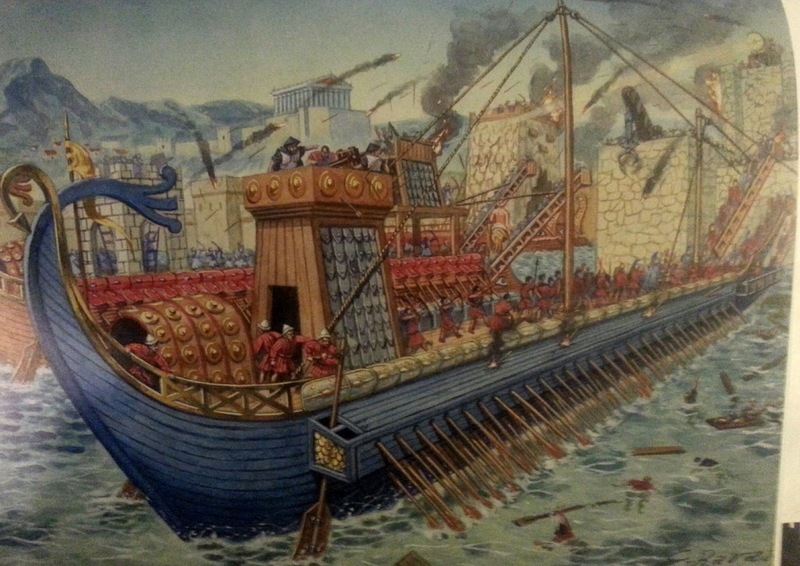 The sambuca of the siege of Syracuse was an arrangement of ships and a ramp for mounting the walls and was so-named because it looked like the musical instrument. Note the soundbox - the ships - and the neck - the ramp - linked by ropes, the strings. The caption to the plate is largely an excerpt from a translation of Polybius (Historia VIII,4). By this means the caption author(s?) 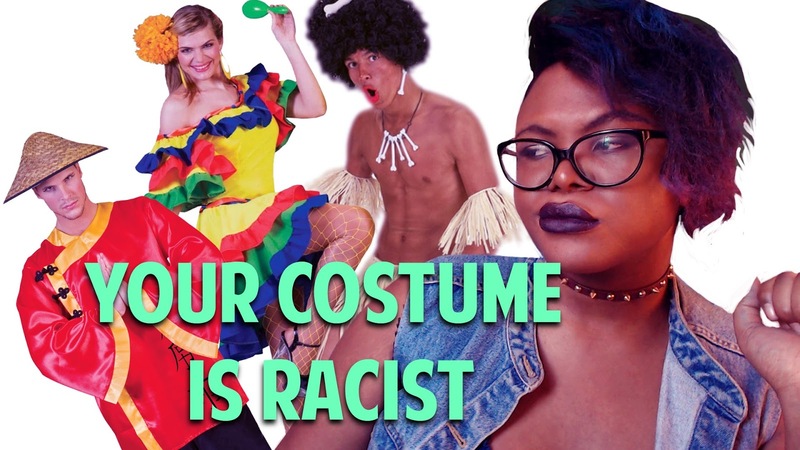 are hoist by their own petard. The contraption in the plate bears little resemblance to Polybius' description. The ship the thing is mounted-on is also odd. OK let's go through Polybius' recipe and see how one should make a sambuca. Nice try but no drinking while blogging! 2) A ladder four feet wide (1.2 metres ) with a side-railing. 3) The next bits need two ships. Here we have only one !? 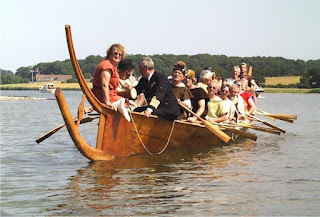 Skip over..
4) The affair is raised by men in the stern pulling lines which run through a block at the masthead. In the plate there are precisely four sailors in the stern. One is musing on the massive cable in front of him. The others are making themselves look busy to avoid having to pull on it. The end of the cable is indistinctly terminated in the deck. If you follow the cables to the masthead it is apparent that the sambuca itself is not connected to the stern. The cables illustrated are th emast-stays. The forward mast-stays terminate in thin air or off the ship on land? The sambuca hangs in the block suspended from the foremast and a single cable runs down therefrom to the deck. 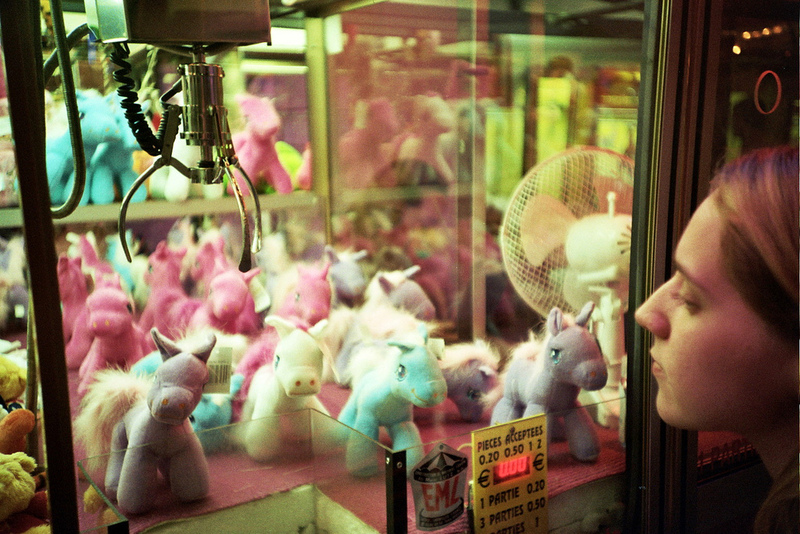 Unmanned. The size of the sambuca makes it unlikely it could have been the foremast that supported it. 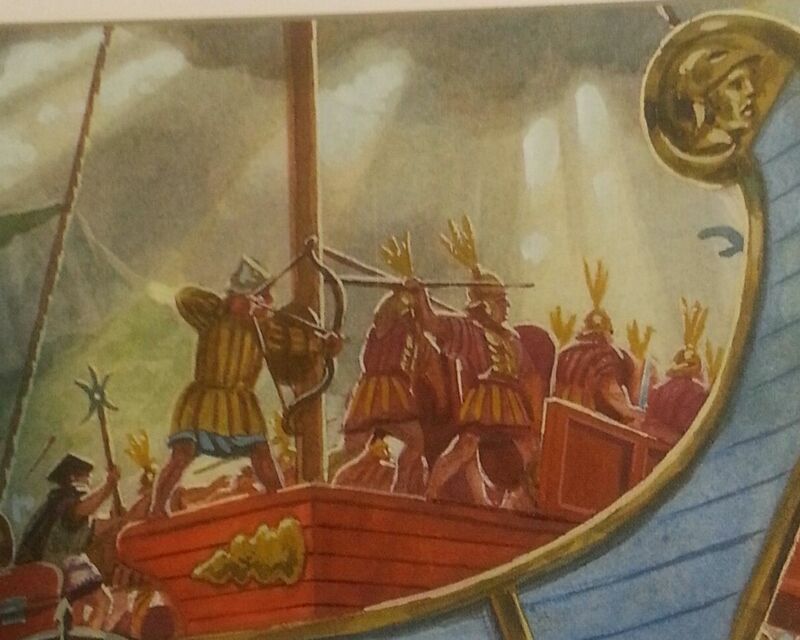 Polybius must mean the mainmast.In any casehe clearly says the sailors hauling it up are in the stern of the ships. 5) The platform at the end of the ladder was protected by wicker screens on three sides which were thrown off when the escalading troops rushed up to get onto the wall. The wicker screens are still in place in the plate. 2)Mount over the junction a ladder 1.2metres wide and very long to project before the ships.The ladder is roofed-over and has side-railings. 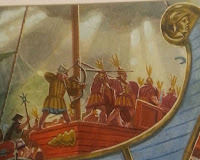 3)Arrange functional tackle running from the ladder over the mainmasts to enable sailors in the sterns of the ships to raise the ladder with the aid of sailors in the bows who will use poles. 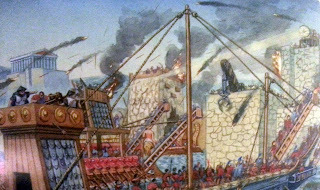 4)The ladder is equipped with a platform at the end occupied by four men protected by wicker screens on three sides. 5) When the platform is in place above the wall then the screens are thrown down and the main escalading party rushes up the ladder and onto the wall. How long was the sambuca ? To get maximum lift the ladder must have had a line fitted as near to its extremity as possible. Maybe 2metres behind the tip or immediately behind the platform. When elevated this point cannot have been raised higher than the top of the mast which was the fulcrum. 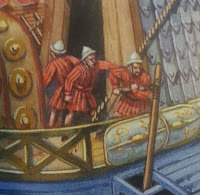 The mast top block of a quinquereme would be at about 12 metres over the waterline. The sambuca was in the order of 17 metres long. 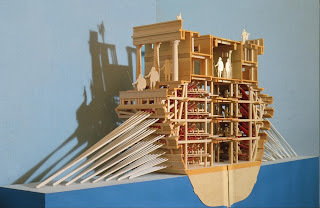 Polybius says it projects a long way forward of the ships and so it does. The sambuca in red projects forward as it lies ready to be raised. The lines to raise it run from behind the landing platform over the mainmasts and to parties of seamen (B) in the sterns ready to haul it up. In the bows (A) of each ship are parties of seamen with poles to help raise and position the ladder. Troops wait on deck ready to swarm up the ladder when the landing platform is in place on the walls of Syracuse. While plate E is down let us kick it some more. The scale of the ship - a quinquereme - is gross. The timbers on the tower at the ship's stern are approximately 20cm or more thick which maybe they have to be because it is armoured with metal shingles and occupied by Chinamen and a bolt-thrower. The height of the deck above the waterline is well over 3 metres judging by the height of the men on the deck. It has a strange gangway built onto the side of the bow. There appear to be men marching up the bow ornament. The pedalion disappears through the oarbox which has two holes in it for some reason. In this situation the pedalion cannot be lifted out of the water by angling it back or outward to any great degree. There is no ventilation course of louvres or apertures for the oarsmen who would soon expire. One should not look landward because the Syracusans are using one of those fairground crane toys to attack the Romans are are shining searchlights on them to set them on fire. The Romans fight back with geometrically impossible combinations of sambucæ. Messrs Connolly and McBride must be gently rotating in their respective Eternities. The odd ship on the' Aristonothos krater' is worth following-up. Let us dig a bit deeper into what is going on with this peculier vessel. 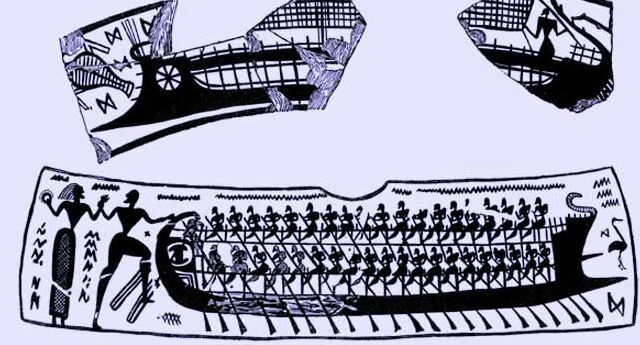 In the previous post I suggested that, for my money, the hooked beak prow of the right-hand ship drawn by Aristonothos was a misinterpretation or, rather, a failed interpretation of what a real ship may have looked like. I have dragged a few additional pieces of evidence to gether to see if more light can be shed on the matter. WHEN DID RAMS FIRST APPEAR ? 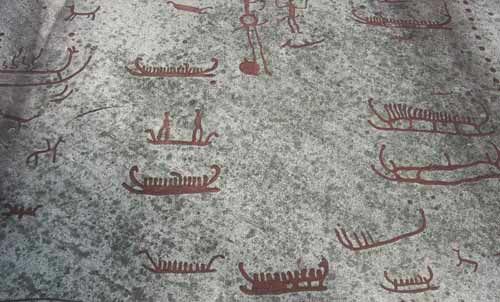 The Aristonothos depiction dates from the first quarters of the seventh century B.C..
We have rock art from Bronze-Age Scandinavia which resemble the Hjørtspring boat from 300b.c. that have structures which are really cut-waters. The very first ram-like structures depicted in Mediterranean art are from ceramic fragments from the proto-Greek or 'Helladic' culture circa 1600B.C. 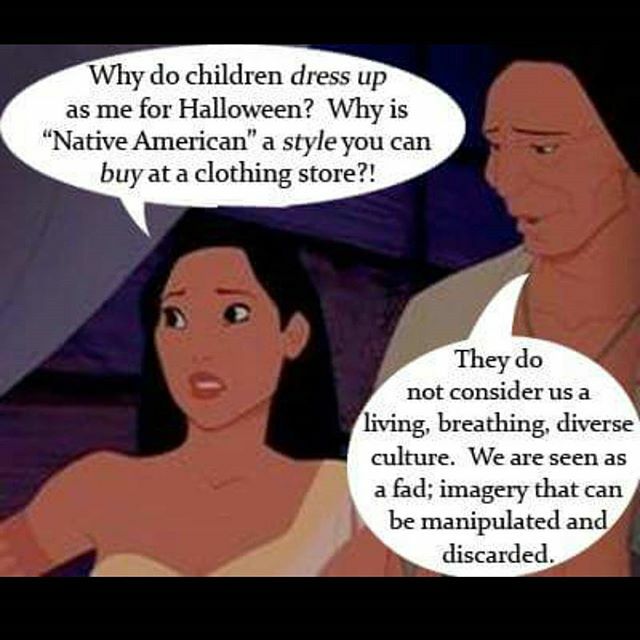 We have no evidence as to their intended function. The shape of the prow is, however, very reminiscent of a later ram. Later depictions of what may be a ram we have are from the mid-to-late eightth century B.C. These are fragments of greek 'Geometric style pattery which are not precisely dateable. The pointed prow of the ships may be a cutwater to aid navigability or may already have become a weapon but we do not know. 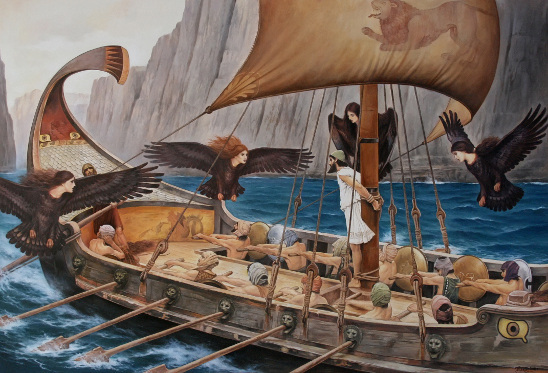 Homeric texts speak of ships but do not mention a ram. 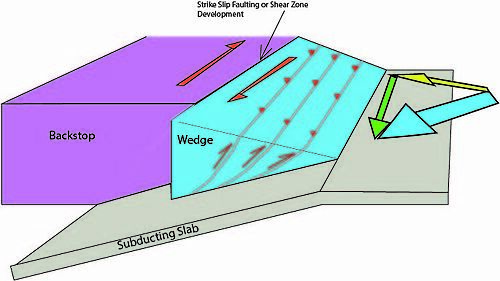 The shape of the prow does differ from the Iolkos fragments. 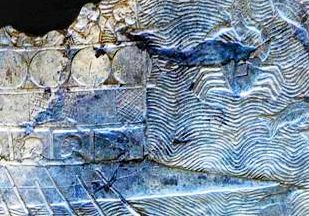 The very first dateable depiction we have of a ship armed with a ram is on the relief slabs from Sennacherib's palace at Nineveh which date to after 701B.C. because they show the flight from Tyre in 701B.C.. It is interesting to note that the ram is not what we come to know and love as a bronze hull-opener in the Classical Age. These rams are pointed cut-waters with a (metal?) sheath. Fastening collar seen to left. The next depictions are contemporary with or later than the Aristonothos picture and show ship's prows modelled as boar's heads. No remains have revealed a structure anything like this. Maybe it is a symbolic representation of the mode of attack ? A charging boar. 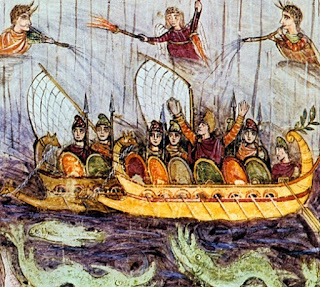 The first written description of ramming in naval warfare is the Battle of the 'Sardinian Sea' in c.540b.c from Herodotos where a Phocaean fleet defeated a combined Carthaginian-Etruscan fleet which outnumbered them two-to-one. 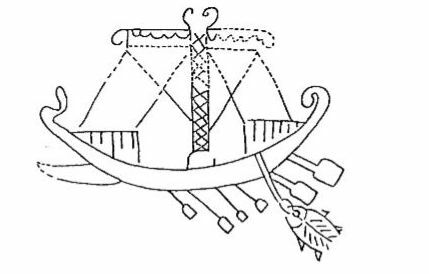 The point of this short survey is to show that there was not a single structure we can identify as a typical ram before the Second Persian War or even the Second. We can identify several structures which resemble the later rams we have definite knowlege of. 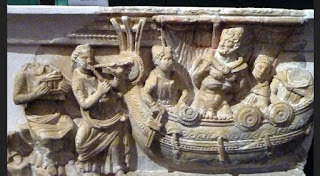 There is some evidence to identify the round ship on the krater as Etruscan. This is on the basis of crab and cross motifs on the shields of the warriors on the round ship. The only problem I see with this is that why would Aristothonos have Etruscan symbols accurately depicted on his vase when he was a colonial Greek. ? Also, crab symbols turn up on coins from Sicily and Italy alike. 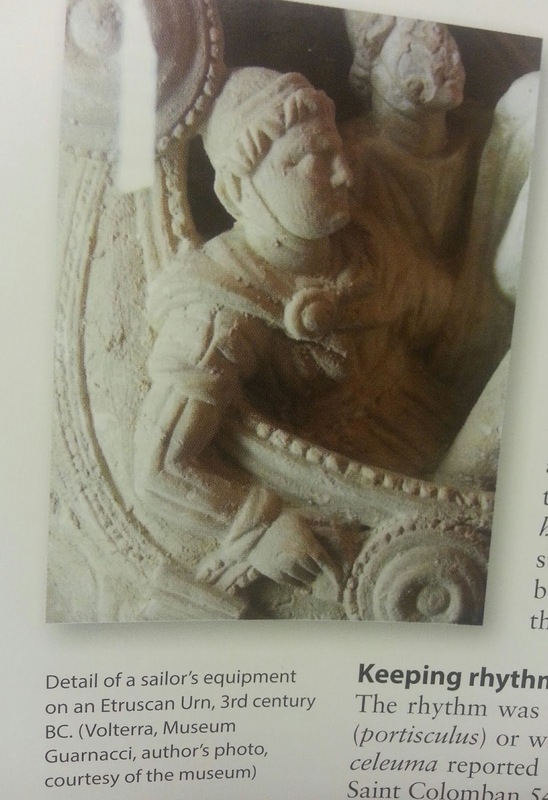 More likely would the explanation be that the whole item is Etruscan but the potter's name agues against this. 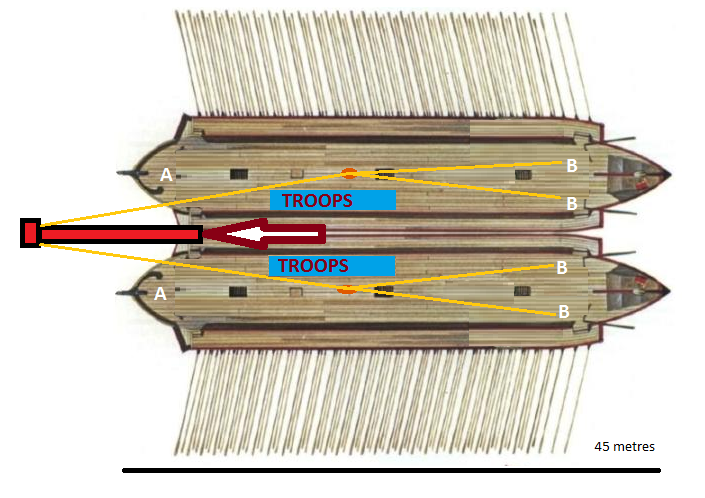 Is there anything we can find to explain the bow structure of the round ship ? 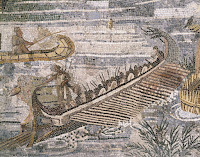 First, the right-hand ship is probably the one the potter identifies with. 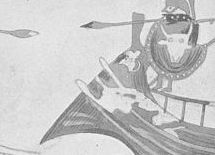 The right-hand ship has a boar's-head ram and is comfortably identified as an attacking warship. This is not two ships out for a sail in consort. Few would argue that an item decorated with a scene of aggression would most likely be ´made, commissioned, owned by the aggressor's faction. People under the Blitz did not hang photos of Heinkel 111s on their living room walls. Next, the target ship is therefore foreign. 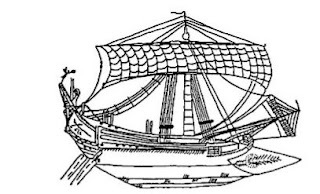 This would make more understandable any misinterpretation of the exotic ship type by the Greek potter. 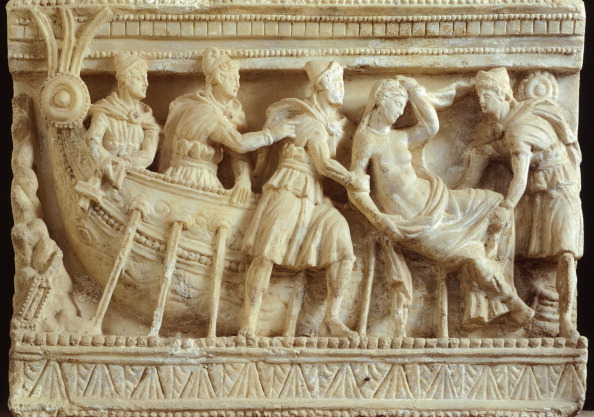 Second, there are some odd ships depicted in non-Etruscan contexts. On a Spartan cloak brooch from 8th century b.c.. This scene seems to be a direct analog of the Aristonothos krater. So the orignal composition is Spartan, not 'Tyrhennian' and the antagonists need not necessarily include Etruscans. In addition, we can see here that the right hand ship is not a 'round ship' but a galley - there are rowers under the catwalk deck. 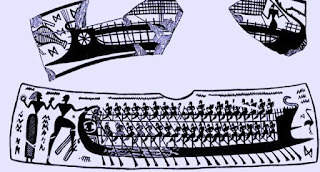 It may be a 'kourkoros' which is is a galley-freighter but it is not a sailing ship as on the krater. Note that the bow structures on both sides have a serrated appearance. Both left and right ships. Closer examination of the krater reveals this detail there, too. On this drawing it looks like wales are extended out in front of the stempost. As they are on later warships also. This serrated edge, again on a manned warship - with a waterline ram - is also shown another brooch which is also Greek from the eighth century b.c..
We have now shown that BOTH details originate in a Greek, not Etruscan context. 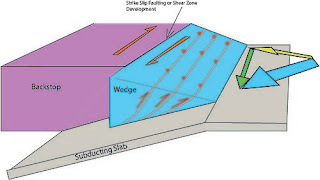 Is there any more we can discover about the 'hook' structure? 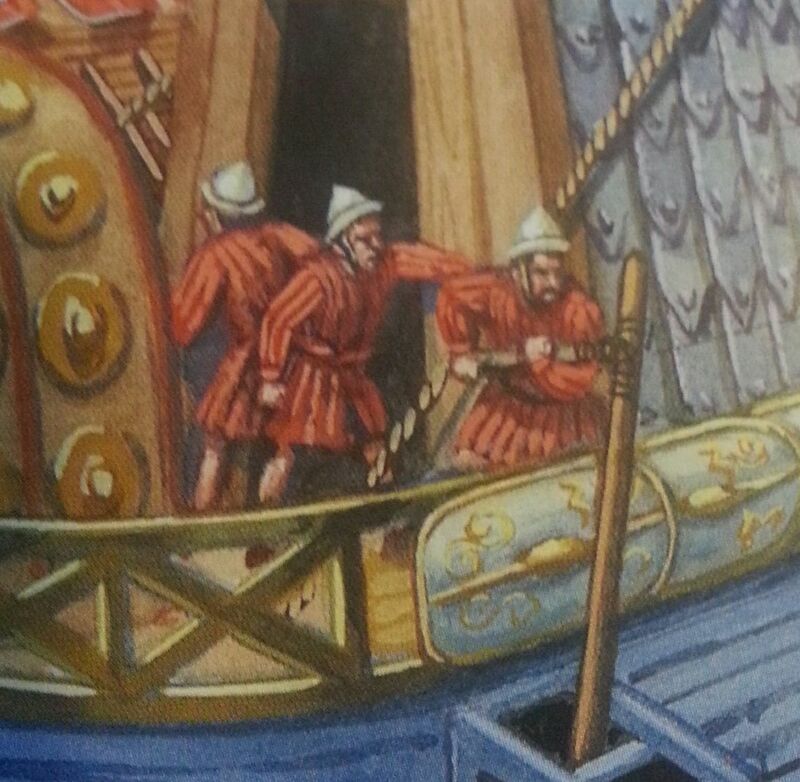 Well, there are some freighters from Roman contexts which have unusual looking bows. 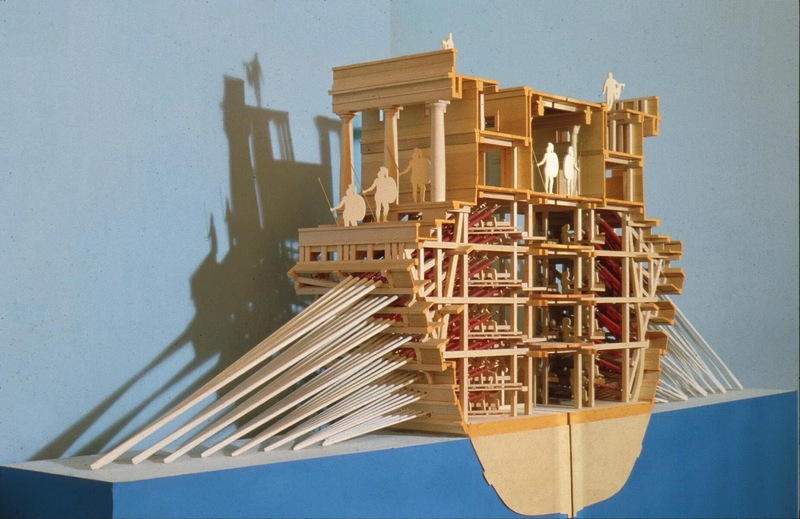 But these do not mimic the Aristonothos ship completely. 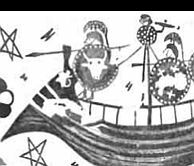 There are 'round ships' with upturned hulls that have a ram/cutwater depicted. The ship at left is definitely from an Etruscan context - Veii in the early seventh century B.C. 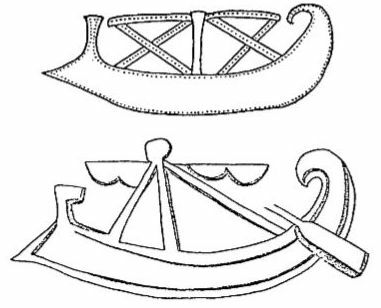 This means thatEtruscan artists could draw a round ship - equipped with mast and sails, upturned prow and a waterline ram. ..and this is only a graffito..This depiction is not so different in age from the Aristonothos krater but a ram has been added convincingly, at the waterline as a warship would have it. 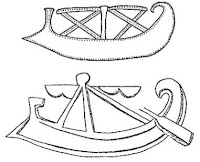 Then we have some ship profiles which a) are Etruscan and b) have a similar form to our subject. The convex bow which ends in a point followd by the stem post is here as on the krater. The ships have has sails, mast and rigging to identify them as round ships. Everything is here except the ram. Oh. yes, and the catwalk deck and the warriors. Here may be the answer so long sought. 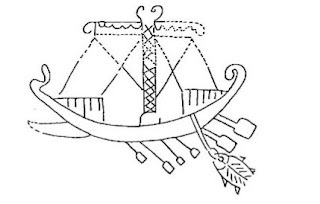 The warriors indicate a fighting ship. The deck for them to parade on indicates a fighting ship. 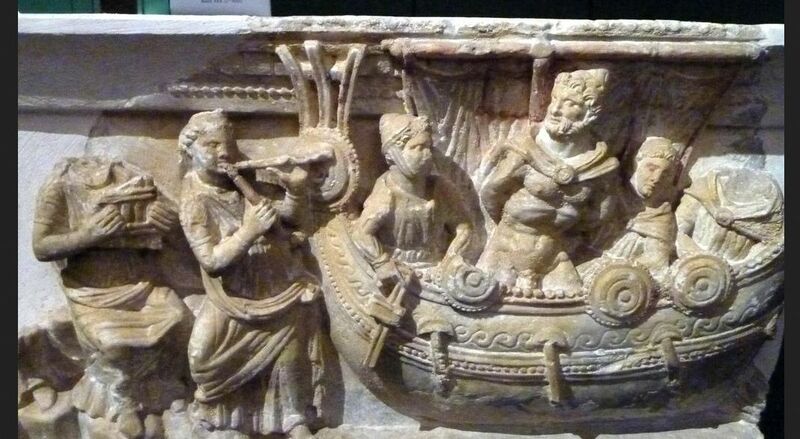 These features together, when transposed to our Etruscan sailing ship produce a foreign/Etruscan ship to a potter. Oh, yes and there should be a ram to make them warships. Add one to taste. 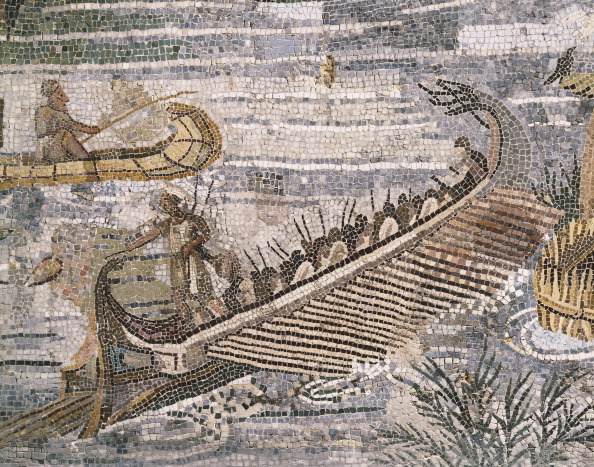 The left-hand ship from the Aristonothos krater contains accurate details from seventh century b.c. warships. However, in an effort to depict a Greek ship attacking an Etruscan one, the 'Observer's Book of Etruscan Ships' not being to hand, the artist produced a mash-up. Nothing too ludicrous but one which showed the difference between 'us' - left ship and 'them' - right ship. 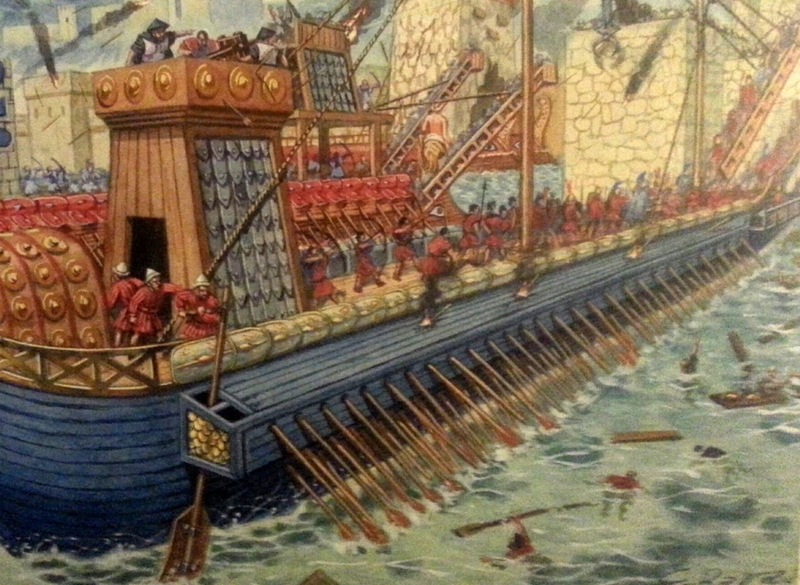 A nautical expert might have told him that a ram needed to be at the waterline to stave-off attacking warships. 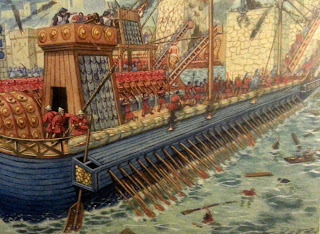 Much later, some ship's rams were mounted to attack the enemy hull just above the waterline but here we are at a time when ram warfare was at its infancy. An impact on the hooked ram would place crazy stresses on the freighter's bow oblique to its structural grain - the longitudinal planking of the ship and the keel. Rams were designed to essentially keep stresses in the plane and direction of the keel where the ship was strongest so a blow could be safely dealt. 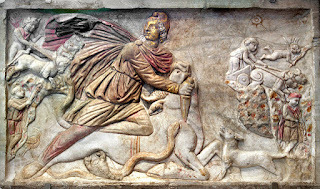 Having discussed one Etruscan topic, I have another in mind. 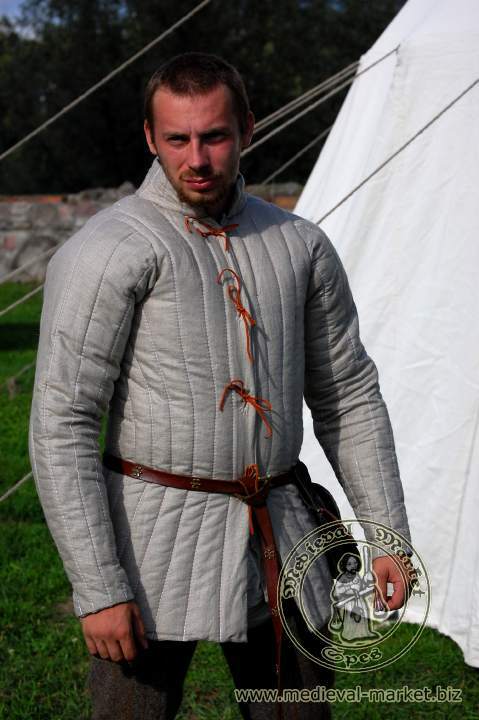 'Fancy Dress for Roman Marines' or 'Does your skipper go naked on watch ?' Coming next.